As part of working for the past few years on this documentary, I’ve been collecting artifacts related to text adventures. 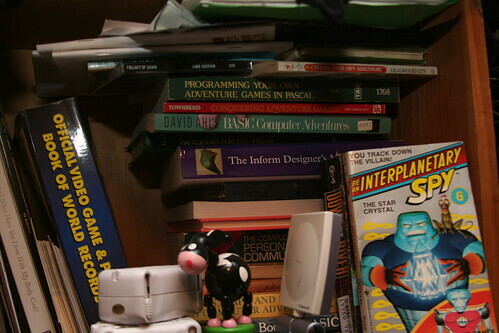 This ranges from things like the stack of adventure-related books above to software, printouts, advertisements, and videotape. A lot will get into the movie one way or another. The books are interesting. Some are just walkthroughs, where an author solves a game as best they can and then tell you the specific steps to solve the games. Others try and give you subtle hints about the way to go so you can discover the final bits yourself. 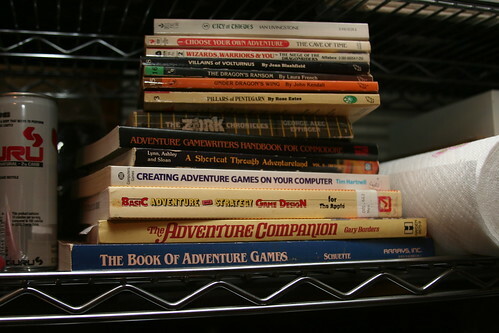 But most interesting to me personally are a couple books specifically geared towards the creation of adventure games. One of these, Writing Basic Adventure Programs for the TRS-80 by Frank Dacosta, is hardbound and far outstrips any reasonable treatment of the subject, including page after page of underlying programming theory to ensure your program would be the most well-constructed game for the TRS-80, ever. Published in 1982, it only had a couple years of possible usefulness for what it was written for, but the general themes and lessons in the book would probably work up to the present day. In regards to your library of adventure game books (and more specifically, adventure gamebooks), if when you’re done your film you find you have no need to maintain your collection I’m confident you could have it avidly dismantled by the community over at gamebooks.org … conversely, if you wished to inflate it to ludicrous proportions, they could likely also be of assistance. One of my weird little habits is I tend to keep all the stuff forever. So no, I’ll probably just archive it and bring stuff out as needed by research or questions. Check out http://trs-80.com/trs80-mag-books.htm#adventure for a list and cover scans of other Adventure related books from the era. DeCosta’s (1982) is probably the oldest there but “Golden Flutes and Great Escapes”, “Basic Adventure and Strategy Game Design” and others are also early ’80s (1984).